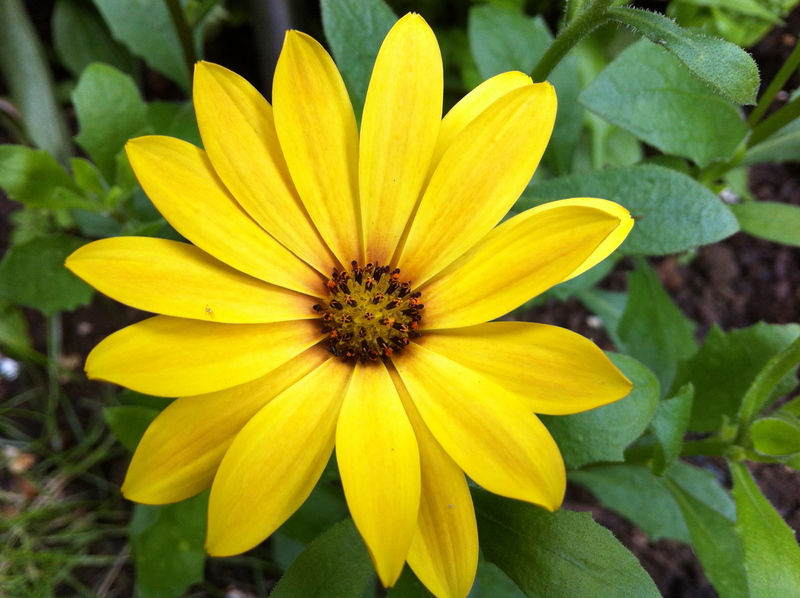 Last year, during the early Autumn I picked up a yellow Osteospermum (Cape Daisy) at a reduced price. At best it had about two months left outside before the first frosts will wipe it out. As far as I know, any colour of Osteospermum other than purple is not frost hardy. My plan was to plonk it in the ground and cut the existing flowers off. Although this sounds an odd thing to do, it encouraged new leafy growth that I then used to take several cuttings. I successfully over wintered the cuttings in the small plastic greenhouse and they all emerged this spring and began to root as soon as the weather started to warm up. When there were clear signs of growth and the cuttings had turned into plants, I potted them on. They were kept in individual 9cm pots for another few months, still in the green house – as a late frost could ruin all this effort in a single night. When roots started to emerge from the bottom of these pots, they were planted out and some have since begun to flower. In a few months, I will take cuttings from this generation and over winter those in the green house just as I did for the last set and the whole cycle will repeat. As I now have five plants instead of one, I will be able to take many more cuttings and keep the process going and create as many of these beautiful sunshine yellow daisies for as long as I can, all for just £1.50 and a bit of effort. The moral of the story is that bargain/reduced or end-of-season plants aren’t always a con. Pick plants that you can take cuttings of for next year or pick plants that have ripe seed or seed heads that you’ll be able to sow. In these cases, you’re buying the plant solely for creating the next generation and it can be a really cheap and satisfying way of doing it.